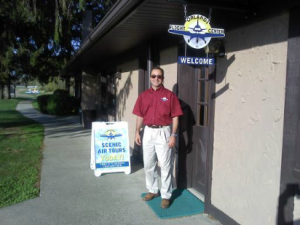 Founded by Geoff Orlandi in the fall of 2012 with the mission to enhance other’s lives through aviation, the Orlandi Flight Center offers flight instruction, aircraft rental and scenic tours in the Blairstown, NJ area. In 2013 and 2014, the Orlandi Flight Center received the AOPA Flight Training Excellence award for providing superior instruction. Orlandi Flight Center was the only school in the northeast region where both the flight school and an individual instructor (Geoff Orlandi) received this honor. The flight school offers any training a pilot would need, from introductory flights or sport pilot or private pilot certification to commercial pilots and ATPs. If you are looking for an instrument rating, multi-engine rating, tail wheel endorsement, or just a flight review, Orlandi has you covered. The Orlandi fleet consists of 1947 Piper J3 Cub as well as a 1969 Cessna 172. Adding to the Orlandi repertoire is a Redbird JAY Flight simulator available for the budget pilot in mind or for when weather conditions are less than ideal for training. The Redbird simulator is available at an hourly rate or an annual fee for unlimited use. The Orlandi Flight Center entrusts Aviation Insurance Resources (AIR) for their flight school insurance and flight simulator insurance needs. Each aircraft insurance expert at AIR shops all of the major markets to provide your flight school with the broadest policy coverage at the best rates. This saves both money and time, leaving your school to do what it does best…instruct and inspire future pilots. Geoff Orlandi’s pledge is to “do everything I can to deliver the most rewarding flying experience available.” Just as AIR’s pledge to him was to provide service with integrity from aviation insurance experts. It all starts with flight schools in the general aviation industry. At Aviation Insurance Resources (AIR), we provide a full range of aircraft insurance and aviation insurance products, including flight school and flight simulator insurance. To find out more about insuring your flight school or simulator, please contact Aviation Insurance Resources by calling 877-247-7767 or visit our website and fill out our quick and easy flight school quote request today. PreviousPrevious post:AIR Returns to the Sebring Sport Aviation ExpoNextNext post:Aircraft insurance FAQ: Where am I covered to fly?